I don’t know how many will share my enthusiasm, but I just found something to really sink my teeth into—though if it were a sandwich, I’d have trouble getting my teeth around it. It’s that big. It practically jumped right out of the Border’s bargain bin into my welcoming arms. Nearly three pounds and 890 pages of meat. It’s called The Big Book of How to Say It. You may already know it; it’s been out for 12 years. Of course, the title caught my eye. At first, I took it for another tome for word geeks. Actually, it’s two tomes, How to Say It by Rosalie Maggio and How to Say It At Work by Jack Griffin. Cringe not; this book has little to do with grammar and everything to do with writing and speaking one’s mind in the most thoughtful, personal and effective way—under almost any practical social or business scenario. The Big Book is also not an etiquette book. While offering suggestions on the most appropriate way to express one’s thoughts, the focus is on choosing the right words and tone for the occasion, customized for the addresser and addressee alike. I immediately bought it for a special someone for Christmas. Now I’m reluctant to give it up. There are more than 60 chapters dealing with everything from expressing (and accepting) a simple condolence to applying for a job, and 58 topics in between. 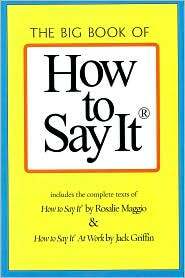 Each chapter includes several options for “How to Say It” as well as “What Not to Say.” There’s also a mini-thesaurus in each chapter, along with handy writing tips to suit the situation. Apologies. Holiday letters. Complaints. Job terminations. Negotiating a promotion. Renegotiating a deadline. Accepting a compliment. Taking criticism. Handling a snafu. Agreeing to a drug test. Announcing the cancellation of a wedding. It’s all there. As a bonus , in one of the chapters dealing with getting a job, there’s a whole section on How to Say it with Clothes, including 28 tips for men and 23 for women. Just remember, the book was written in 1998. If you’re looking for just the right gift for everyone on your shopping list this holiday season–word nerd, etiquette geek or lay person–then grab a forklift and head on over to Borders. You could order online but the shipping might cost more than the book. Immediately went to Amazon and ordered several third editions for Christmas giving. Way cool! This raises a question; is it acceptable to give a book you more than just flipped through as a present? That is, how much of a book can one read before wrapping it up and giving it as an official gift, as opposed to just passing on a book the giver first enjoyed? Without consulting any authority on the matter, I’ll say that, in my circle of close friends and family, quite acceptable. I tend to provide disclosure. I suspect pre-reading would be a no-no if giving a book as an official gift in a business or diplomatic situation. Who knows, the answer to your question might just be in the Big Book.